Soup making is fostering a new life for the women in upstate New York and it is all thanks an amazing non-profit work experience program that I recently learned about called Sisters’ Soup & Bean Works. 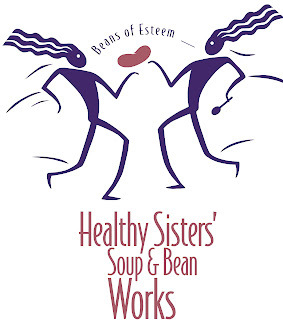 As a program of the Catholic Family Center's Workforce Development Department, Sisters’ Soup & Bean Works is designed to allow women to change their lives as they go from 'dependence to independence' as they become a part of a soup making company. This includes being involved in all aspects of the business such as the production, quality assurance, marketing and inventory control of the soups. Through this program women in need have the opportunity to "earn steady paycheck, develop self-confidence and learn job skills needed to enter or re-enter the workforce and achieve self-sufficiency," according to the organization. As a soup-based non-profit, the company produces some dips and several soup mixes such as a Six-Bean Organic Bean Soup, a Curried Lentil Soup, an Old-Fashioned Chili, Max’s Tuscan Bean, Golisano’s Bountiful Bean Soup, June's Split Pea Soup, and Rita's Ragin' Cajun Bean Soup, which I had the opportunity to test out. All of the soups mixes contain the beans, various dried herbs and dehydrated vegetables, but require additional ingredients such as onions, garlic, bay leaves, peppers or tomatoes - as in the case of the Ragin' Cajun mix. Since I make soups all the time, it was nice to have a "break" from the rigors of chopping and planning as most of the ingredients were already prepared and packaged. Chopping a few onions and adding salt and pepper felt like a vacation and the result wasn't your typical over-the-counter soup mix. After following a few simple directions, my Healthy Sisters Soup was ready and was loving the rich and flavorful spices that also included some tips on how to make the soup more authentic such as by adding spicy andouille sausage or broth. It tasted fresh and homemade - much like a gourmet soup without having to put a lot of work and effort into it. Providing delicious-tasting soups, Soup Sisters' is fostering a unique community of soup making and business while also nourishing and supporting women in need. All of the soups are available for sale online and at most Wegmans stores in the Northeast. There are also plans for the soups to be available in NYC at various retailers. Happy Easter! Whether you celebrate the holiday for religious reasons or enjoy it for the act of exchanging colorful baskets and coloring eggs with your kids, this spring holiday is also a great way to test out and sample some new soup recipes. I recently found several inspiring recipes that concentrate on the use of eggs and egg yolks as well as those that use meat stocks and even some that use various parts of a lamb. Whether you are feeling adventurous or seeking something a little simpler this Easter, I hope you try out something new on this short, but sweet Easter Soup recipe list. Roman Easter Soup - Created by Chef Gina DePalma (pastry chef at Babbo), this two-part Roman Easter Soup first involves the making a beef and lamb broth and then the actual soup that is made with egg yolks, herbs, grated cheese, bread, and lemon. DePalma describes the soup as "balanced" thanks to the rich combination of the eggs and the meaty broth. Definitely one to try this Easter. Easter Soup - Featured on Food.com, this interesting soup by Lorac features the quintessential Easter food - eggs - and pairs it with kielbasa, heavy cream, vinegar and horseradish. Finished in about an hour, this rich soup would be a create way to start any Easter meal. Mageiritsa Easter Soup - An Easter Soup for the adventurous eater, this soup by Santorini.com includes some basic components of a soup (dill, onions, olive oil, lemon, white wine and thyme) along with the liver, lungs and intestines of a lamb. If you can manage to find all of those parts, Santorini.com provides a very detailed explanation of how to prepare the organs and then the Avgolemoni sauce. Designed to feed six people, this can be a very interesting experience for your Easter dinner - if you are up for the challenge. What soups are making on Easter? I first learned about nettles from Do Chara in my Soup Recipes from the UK post, and most recently when I conducted a link rundown for St. Patrick's Day on The Huffington Post. Stinging nettles, as they are traditionally called, are a weed that is grown throughout Ireland that is also enjoyed in numerous dishes such as in soup. 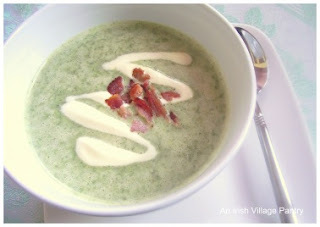 An Irish Village Pantry, who was also featured on Huff Post for her Ancient Irish Leek and Oatmeal Soup, recently shared with me this unique spring soup recipe that was created as an act of revenge of sorts after the wild-growing nettle plants took over her rose garden. In her post, she also recounts how her Great-Grandmother used to make this soup all the time who told the family about its rich nutritional properties like vitamins A and C, iron and even some protein. Sheelagh's recipe is a great addition to try a new soup this spring, which includes onions, potatoes, stock, milk, creme fraiche, and of course the stinging nettles. Sheelagh also notes that those concerned about the nettles should take note the formic acid (what gives the nettles its sting) is killed through the cooking process but you should also wear gloves through out the preparation of the soup to avoid being stung. Enjoy! Peel and chop the onion and potato. Put a small to medium-sized saucepan over a medium heat with the oil and butter. Add the chopped onion and potato and gently cook without color for 3 minutes. In the meantime, wash the nettles in a colander using a fork - or wear gloves! Add the milk and stock to the onion and potato and cook for another five minutes or until soft. Add the nettles and parsley and cook for another two to three minutes until the nettles are wilted but still retaining a green color. Puree in a blender or food processor and season to taste with salt and pepper. Serve and garnish with cream or creme fraiche and crispy bacon bits or lardons. Passover, a Jewish holy day, begins today and there are many interesting soup recipes out there to celebrate this eight-day holiday. I discovered a modern take on the matzo ball soup on Food 2, a cold beet soup, and even a gluten-free version using almond and flax seed meal. I also created a matzo ball soup using three different types of matzo balls - a traditional matzo ball, a beet/dill matzo ball, and a parsnip and sweet potato matzo ball. I hope you enjoy some of these recipes and try one for yourself this Passover. Passover Soup with Chicken Dumplings - Featured on AllRecipes.com, this soup is made using matzo meal, eggs, and ground chicken to fuse the idea of matzo balls and chicken meatballs into one. Created by Umyum, this simple soup also uses cinnamon, rice, and chicken broth. Mezzaluna Matzo Sweet Potato Soup - This two-part recipe by Food 2 involves the creation of the mezzaluna matzo with matzo meal, garlic, ginger, chicken fat and various herbs (rosemary and parsley) and the soup part, which is composed of apples, onions, sweet potatoes, sugar, and cumin. I love the interesting combination of flavors and the new way to enjoy both a matzo ball and a sweet potato soup. 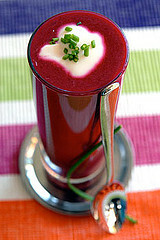 Cold Beet Soup - This cold beet soup or borscht is essentially just beets, lemon juice, onion, and some ice. Not only great for Passover, this soup, created by Baby Boomer Advisor Club, is an exciting recipe to try as the weather gets nicer out. Matzo Ball Soup - One of my favorite soup recipes, I wanted to vary the recipe a bit by creating flavored matzo balls. I started by making a rich chicken broth with chicken, carrots, parsnips, onions, dill and parsley where I then created a traditional matzo ball, a matzo ball with beets and dill, and one with sweet potatoes and parsnip. I loved how easy it was to vary and my new favorite, the beet matzo, made for a rich and savory addition to the soup. Gluten-Free Matzo Ball Soup - Those of you who have allergies to gluten will love this gluten-free matzoh ball soup that according to What's Cooking (creator of the recipe) "comes closer to capturing the texture than any recipe I have tried." Instead of matzo meal, this recipe uses blanched almond meal, potato starch, flax seed meal, and eggs to create the matzo balls and a combination of chicken fat, dill, white pepper and salt for the broth. What soups are making for passover? A majority of my soup recipes are created on a whim. It all depends - some days I'll think of an idea a day or two before a post and decide that is the soup I want to try or I'll be inspired by a picture or an ingredient and take it from there. Not the most organized system and thankfully there are websites out there like AllRecipes.com that can help me get it together. I recently learned more about getting organized and planning of my soups (and meals, in general) at an event sponsored by AllRecipes.com featuring tips from Deb of The Make-Ahead Mamas. The event also included tips on how to use the new Menu Planner on AllRecipes.com, an online tool is designed to help users create their own personalized meal plan through a unique search that is catered to their needs. The feature acts likes like an app where users can simply drop and drag various recipes into their personal database that is saved into a weekly menu plan. This allows users to create meals for up to 10 days that also creates a personalized shopping list for you based on your recipes. The tool also allows home cooks to sort by dish type (appetizer, beverage, bread, side dish, etc), cuisine (African, American, French, German, etc), ingredient type, and how quick a dish can be prepared. Users can also locate pre-made menus such as 'Three Courses in Thirty Minutes' or 'Low Cal and Loving It' or by creating creative themed meals such as those for holidays, parties, or those based on the season. 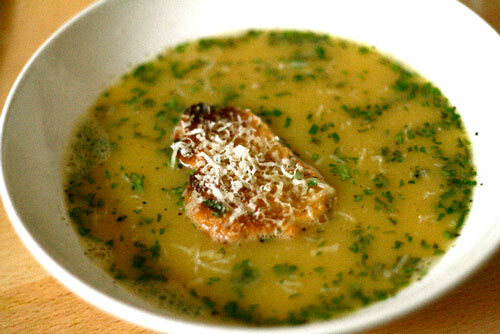 I tested this concept out for a potential spring soup swap that I hope to have next month. Choosing unique soups that I have never worked with I found a Lettuce and Tarragon Soup, a rich Brie Soup, a Classic Vichyssoie, a Ratatouille, and a French Spring Soup that I am excited to learn more about and eventually create. The planner then gave me my personalized grocery list for these soups and allowed me to save the recipes for a future date. After only using the planner once, I was excited to have my organized soup list and menu options planned and ready to go. With a personalized search featuring over 1,300 menu options, getting organized in the kitchen just got a lot easier. With the temperatures almost reaching 80 degrees today I was really excited to try out a lighter soup recipe - that was both easy to prepare and quick. Not quite ready for chilled soups, I decided to make a crisp Lettuce Soup after reading various recipes on Epicurious.com, The Nourishing Gourmet, and in this months issue of Everyday with Rachael Ray. For my variation, I used a simple combination of onions, garlic, leeks, celery, peas, rosemary, thyme, lemon, and of course a thick head of lettuce to complete this earthy soup. A soup I never tried before, I was pleasantly surprised by its interesting flavors that I found really worked with the subtle use of thyme and rosemary and tart from the lemon. This soup can also easily be varied to include various types of lettuce leaves and herbs as well as the addition of cream or potatoes - depending on your preferences. For With the warmer days ahead, I am definitely inspired to test out and enjoy more soups like this! Drizzle the olive oil into a medium-sized pot. Cut up the leeks, garlic, and onion and let saute. Add the vegetable stock (or water) and let boil. Add the peas, celery, rosemary and thyme and cover. Let cook for 15 minutes. Break apart the lettuce leaves and add them to the pot. Let cook for another 10 minutes. Season with salt and pepper and blend. Drizzle with some lemon juice and top with some lettuce leaves for a garnish. Enjoy! How do you make your lettuce soup? This week I had the opportunity to attend an interactive cooking event at Rachael Ray's test kitchen in NYC. Sponsored by AllRecipes.com, the go-to online recipe resource (unless you want a soup recipe and then you know where to go), allowed us to learn about their exciting interactive menu planner (more on that in a future post) and about an exciting cooking community called the Make-Ahead Mamas. Deb Kapsner (or Busy Spoons) of Make-Ahead Mamas was on-hand to teach us how to cook delicious and healthy meals through their model of variety, community, and organization. The group is made up of 8 Seattle mamas who get together every 8 weeks to prepare 8-10 meals for their families. Not only a great concept to get out of the boring dinner rut, the Make-Ahead Mamas is a community whose members get together to share the ups and downs of parenting as they cook, enjoy wine, and try to make their lives easier by planning ahead. At the interactive event, I was able to test out a delicious Beef Bulgogi with lettuce leaves and noodles, the flaky and savory Spinach Spanakopita, and Deb's flavorful Make-Ahead Vegetarian Moroccan Stew. All of the recipes were fantastic that also made me realize dinner doesn't have to be dull. Being all about soups and stews, I instantly fell in love with the rich blend of flavors (cumin, ginger, cloves, nutmeg, turmeric, and cinnamon) used in this stew, along with blend of kale, sweet potatoes, lentils and chickpeas for protein. Being a hands-on event, we were all given stations to start chopping, packing and scooping up spices so that we could create our own Moroccan Stew at home. Still thinking about the delicious and easy-to-prepare recipes a day later, I decided to make the stew with my daughter Little Soupy. Since all of the ingredients were cut up at the event, this was one of the easiest stews I have ever made. We loved adding the layers of ingredient - not to mention how amazing it made my kitchen smell. An inspiring and fun afternoon, the Make-Ahead Mamas is a great way to combine varied eating within a fun and supportive community. 1. Combine cinnamon, cumin, ginger, cloves, nutmeg, turmeric, curry powder, and salt in a large bowl, reserve. 2. Melt butter in a large pot over medium heat. Cook the onion in the butter until soft and just beginning to brown, 5 to 10 minutes. Stir in the shredded kale and reserved spice mixture. Cook for 2 minutes or until kale begins to wilt and spices are fragrant. 3. Pour the vegetable broth into the pot. Stir in the tomatoes, honey, carrots, sweet potatoes, potatoes, garbanzo beans, dried apricots, and lentils. Bring to boil; reduce heat to low. 4. Simmer stew for 30 minutes or until the vegetables and lentils are cooked and tender. Season with black pepper to taste. 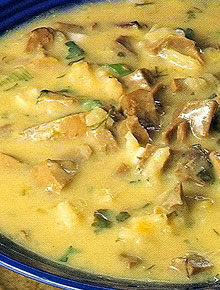 If desired, combine optional cornstarch and water; stir into stew. Simmer until stew has thickened, about 5 minutes. To learn more about the Make-Ahead Mamas, please like them on Facebook. After making the easy meat stock I wanted to create a new soup with savory beef. Beef barley instantly came to mind since this was a soup I had enjoyed numerous times (both at the SouperBowl and at the Soup Swap) but actually hadn't made myself. Using the rich flavors from the stock, I added in some sage, parsley, thyme, barley, mushrooms and the meat I saved from the first batch of stock. Since the flavors were already extracted from the stock, all it really needed in the end was some salt and pepper. I also found that the barley soaked up a lot of the liquid so I had to add more water towards the end. A delicious and comforting soup that even my picky three-old-year enjoyed. Even better? I have another 4 cups of stock left to try another experiment with this savory and economical soup. Any ideas? Heat up the stock in a medium-sized pot. Cut up the onions and add them to the pot, along with the parsley, sage, thyme, and bay leaves. Add in the extra meat or new batch and cover. Let cook for 20 minutes. Cut up the mushrooms and carrots and add them to the pot, along with the barley. Cover and let cook for another 20-30 minutes - you may need to add water. Taste with salt and pepper and enjoy! How do you make your beef barley? Soup is not only a comforting meal to share amongst friends and family members but it is also a great way to feed numerous people that are need - while providing them with a delicious, healthy, and nourishing meal. I recently read on What’s Cooking with Kids about Michelle's exciting partnership with Studio 4 Art, a California-based art studio, to help local families that are need by getting the community involved to make a small donation, create art, and enjoy soup. Inspired by this incredible event, I also discovered a few more charities and organizations that focus on feeding soup and meals to those in need. I hope this list inspires you to do more for your community through soup making - it certainly has for me. 1. The Bowls that Keep Feeding - Studio 4 Art and What’s Cooking with Kids recently teamed up for a second annual fundraiser to help feed local families in need. This not only involved eating soup but enabled children in the community to create their own unique soup bowls. Guests simply had to pay a small donation for a hand-thrown bowl that was filled up with a comforting bowl of Vegetarian Butternut Squash, a Vegetarian Chili with Butternut Squash and Black Beans, a Minestrone and a Tortilla Soup. Art plus soup - now, that's a beautiful combination! 2. Soup Sisters - A non-profit social network based in Canada, Soup Sisters provides a nourishing bowls of soup to women, children and youth that suffer from domestic abuse and family violence. In 2009, the organization expanded and launched Broth Brothers who support homeless youth as they make the transition into mainstream culture. Over the course of the year, Soup Sisters and Broth Brothers serve approximately 150-200 servings of soup. 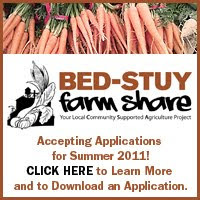 For additional information about this organization, please visit: http://www.soupsisters.org/index.php. 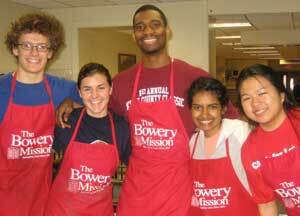 What soup organizations or charities do you belong to?